This interview took place on: July 4, 2017. Click here for Wavorly's Artist Profile page. JFH (David Craft): First off, let me say welcome back! I was incredibly sad to see Wavorly close up shop earlier this decade; I've always felt that the band has had more to say. Honestly, I was pretty excited when you dropped the rumor that more music might be coming. How exactly did the former members get back on board? Dave Strovall: There was date on the Roadshow tour where me and Teddy were playing near Albuquerque. Matt came out to hang and we started reminiscing about Wavorly and talking about how crazy it was that our 10 year anniversary of Conquering the Fear of Flight was coming up. We wanted to do something special for our fans to celebrate that record and also to relive a little piece of it ourselves. Matt Lott: Yeah, so we kind of threw the idea out here on social media last year, and got tons of encouraging feedback. So, here we are. It's really exciting. JFH (David): In light of the Wavorly's return to the stage - Dave, how much will you still be involved with Audio Adrenaline? Dave: I'll definitely still be involved! I've got AA shows on the books coming up. Wavorly isn't planning on touring (mainly because our wives won't let us, haha), so it shouldn't be a conflict. JFH (David): What has been the greatest challenge or concern in regards to resurrecting Wavorly? Dave: TIME. Most of us have kids now, and when people say "kids change everything," they aren't freaking lying, haha. We had all these ideas we wanted to do and it was a race against the clock to get everything done before June. All of us have busy careers now and getting it all together was definitely a challenge. But getting to work with my brothers again was well worth it! Matt: Yes, I'd say it's definitely making time. Time and money, haha. We're super blessed that everyone worked so hard and that things came together the way they did. And that we've had the response we've had! It's so encouraging to have people tell us that the new songs are actually good. JFH (David): The musical extro at the end of "Strangers in Love" is highly reminiscent of the interludes throughout Conquering the Fear of Flight. Is this simply representative of Wavorly's style, or does it serve as a sort of tie-in to the band's previous projects? Dave: I still write a lot of instrumental music these days. I've had the opportunity to score a couple of short films, which was awesome. So, I really wanted to tie the new stuff to our first record with an interlude. That was the plan from the beginning. The super talented violinist Laura Epling did an amazing job. JFH (David): I really enjoyed hearing the new style of music with both tracks, but especially "Pressure." It's quite different from past releases, and seems to pull in elements from a pretty sizeable spectrum. How did the track come together, and is this a good indicator of how Wavorly has musically evolved since disbanding? Dave: It's definitely different for us and a great indicator of what we want to do going forward. I wrote this song out of sheer frustration with the Nashville music industry, haha. Teddy and I made a demo of this song after Wavorly was done because we just wanted to release some fun music together. As soon as we decided to do a couple songs under Wavorly, I knew we had to include this one. JFH (David): For both "Strangers in Love" and "Pressure," how would you describe their lyrical messages and what they're addressing? Matt: They're both kind of layered, but I'd say that "Pressure" is the more straightforward song, mainly being about just getting sick of the status quo in life, maybe at work or just life in general. It's about those times where you just want to push back and make things happen. It's just a fun rally cry to anyone that's ever felt like they were on the outside looking in, at least to me. "Strangers in Love" is a bit more nuanced, because it's basically about my relationship with faith, and not specifically my faith in Christ, but faith as a concept. It's interesting to me that something so personal (it seems to me that a person's faith is probably one of, if not the most personal thing about them) and so important that it can, at times, feel completely alien, completely unknown. Almost like a stranger, and yet at the same time, your closest friend, ally, or lover. It's about that relationship. I don't know if that necessarily makes sense to anyone else but me, so that might be a little confusing, and if it is, you can equate it to a person-to-person relationship. Sometimes the people we love the most can feel the most alien to us. JFH (David): While it's pretty exciting to hear the new mini-EP, I'm sure that I'm not the only listener who would love to hear more. Is Movement One paving the way for 'Movement Two,' other future releases, or an LP? Dave: How could you possibly want more? I mean, isn't 2 songs every 5 years enough?? haha. We are definitely planning to release more. To keep this train going, we're going to need support from our fans. I produced the tracks, but we also hired Jay Hall (incredible mixer and human being), Jared Fox (awesome drum engineer), and Chris Graham (great mastering guy) to make the tracks sound the way they do. All members of Wavorly (past and present) made time to record these songs as well. I feel like we've created a great team and workflow, so it can't just end here! I want to keep releasing mini-EP's as long as we can. There should definitely be a word for "mini-EP". Any suggestions?? Matt: Yeah, it's like doing a crowd fund in reverse, haha. We figure it's only $2, so maybe our fans will come through and pick it up. The more that Movement One brings in, the more likely it is that we get a Movement Two, etc. We shall see! Either way, it's just great to be working together and putting new music out again. It's a special blessing. 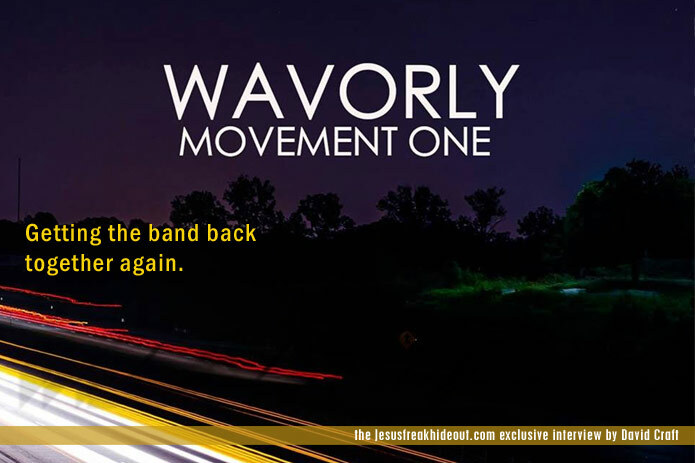 Wavorly's latest project, Movement One is available now wherever digital music is sold!